100 Watts at 25°C Case Temperature Heat Sink Mounted. Single M3 Screw Mounting to Heat Sink. Molded Case for Protection and Easy to Mount. 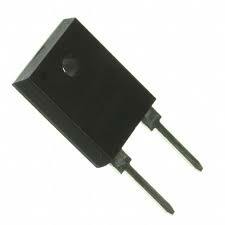 Gate Resistors in Power Supplies. Load and Dumping Resistors in CRT Monitors. Terminal Resistance in RF Power Amplifiers.